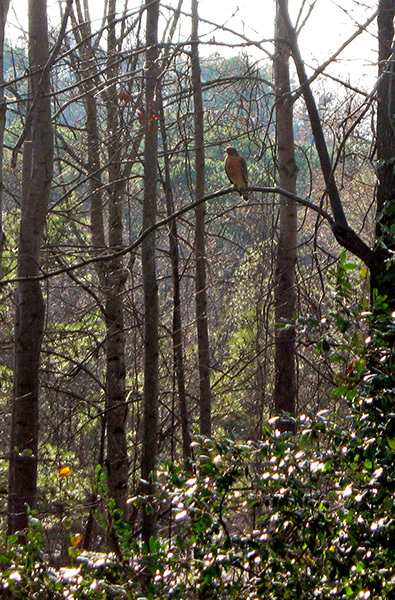 What's right with the world: hawks in your backyard. 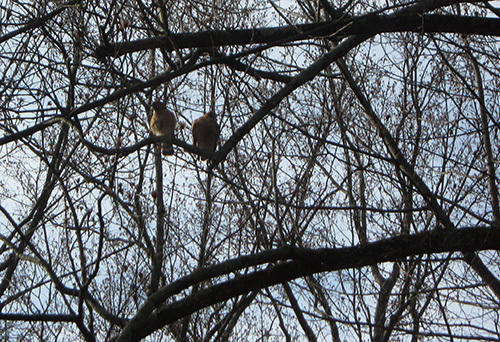 A mating pair of Red-shouldered hawks have taken up residence in my back yard. We see them almost every day, perched stoically on a branch or gliding effortlessly through the oaks and maples. Magnificent birds. I have yet to witness a kill, though I have seen them active down on the ground in a way that suggests I just missed one. With any luck, these two will deplete the local population of squirrels, chipmunks and moles that have been laid waste to the lawn I'm trying to cultivate. Will there be baby hawks soon? You're quite lucky that they've taken up residence in your backyard. Our local pair nest elsewhere in the vicinity, and drop by occasionally to survey the squirrels gorging themselves at the feeders in my parents' yard. I did once witness a redtail striking at a squirrel on the side of an oak not far from our old office building. He missed, and flapped about a bit, as his talons sunk deeply into the bark, a sight made all the more vivid by the fact that he had flown right past my windshield fractions of a second before the strike. Fantastic. What is it about raptors? I'm sure I'm not the only one for whom The Windhover comes to mind. We had two bald eagles circling over Broomfield a couple weeks ago (that's suburban Denver metro area). That was unexpected. Nice. I hope they stay long enough to obtain names for themselves and their offspring. I'm pretty sure I had a Cooper's hawk on my front steps' railing a couple of weeks ago, but he didn't hang around long enough for me to snap a picture. He was impressive--big guy.